I just finished reading The Dog That Saved Stewart Coolidge. I admit, I picked the book because the dog on the cover is quite cute, and the description sounded really interesting. When a stray dog helps himself to a bone from a display in the supermarket, he doesn't know his actions will brand him a criminal and spark a romance between two humans. Stewart Coolidge works as a bag boy at the store, and his outraged boss offers a reward and demands Stewart catch the thieving animal. He fails at that, but now he finally has the perfect excuse to talk to his cute neighbor, Lisa. Lisa has always dreamed of being a journalist and asks Stewart if she can interview him for the local paper. As she gets to know Stewart, she likes him more and more, and she's delighted to learn he shares her Christian faith. Stewart can't bring himself to tell her she's mistaken, that he's not religious at all. And that's not Stewart's only deception. When the dog shows up on the doorstep of their building, Stewart decides to harbor the furry fugitive. 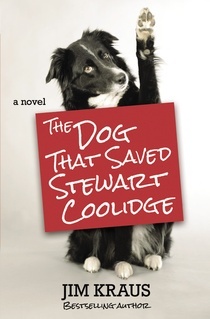 But this is no ordinary dog, he has a divine sense of how things should be--and recognizing how much Stewart needs Lisa, he decides to do all he can to bring them together. While this book was OK and a fairly quick and simple read, I don't feel that it lived up to its description. Things happened - the dog stole from the local grocery store (repeatedly) and Stewart took the dog in (instead of catching him and turning him over to the authorities), and then Stewart finally got to know the cute girl downstairs in the process. It all sounds good, but it really didn't feel believable or that Point A really led to Point B. The story just doesn't seem to carry itself, and I wasn't convinced. I'm not sure that really makes sense, so obviously Jim Kraus is a better writer than I am, but I just don't think his writing is for me.